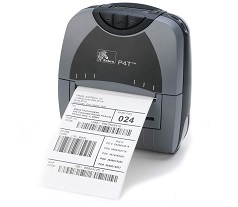 Zebra's P4T is the world's first mobile thermal transfer printer with optional RFID upgradability. It prints long life bar code labels, RFID labels and documents up to 4" wide that withstand harsh and outdoor environments. Offering advanced wireless connectivity, the P4T boasts an array of features that easily handle customers' printing needs, and stands up to the most demanding work environments.